Being ashy is unacceptable IF the reason is due to the lack of exfoliating and moisturizing out of sheer laziness and carelessness. Exfoliating and moisturizing is a lot more beneficial than just making your skin look more presentable. Exfoliating helps remove dead skin cells from the surface of your skin, revealing younger, smoother cells. As you age, your cell turnover rate decreases, exfoliating is a simple way to speed up and assist your body in getting rid of those dead skin cells. The buildup of dead skin cells results in dry, dull, or flaky skin. In addition to improving dry, dull, or flaky skin; exfoliating, improves skin tone, skin texture, allows your skin to appear younger, and improves blood circulation. Now, an increase in blood flow to the surface of your skin is important; the actual circular motion done while exfoliating is responsible for this increase. The increase in circulation promotes cell growth, which in turn promotes healthier looking skin, increasing your overall glow. Exfoliating also prevents ingrown hair. Ingrown hair is painful, unattractive, and leaves behind scars. An ingrown hair is caused by clogged hair follicles or the hair being too weak to penetrate the skin (this happens when the hair is growing back after being completely removed from the hair follicle). Exfoliating removes the dead skin cells and dirt that clog the hair follicle, and softens the skin so the hair grows through the follicle easier. And last, but certainly not least, exfoliating preps your skin for the next step, moisturizing. After exfoliating, all these fresh, new skin cells are ready to allow the moisturizer to penetrate deeper layers of the skin. 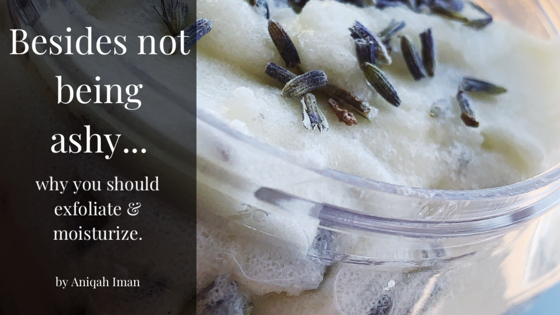 Moisturizing is detrimental to your skin’s health. Your skin cells regenerate and replace themselves daily, and if you exfoliate regularly, cell renewal is increased. These new skin cells are now more vulnerable to infection, skin cancer, and harmful environmental factors. A moisturizer acts as a layer of protection. If you are using a moisturizer with the right ingredients, mainly essential fatty acids, it will not only hydrate your skin but also retain moisture. Hydrated skin can repair and renew itself faster than dehydrated skin. Dehydrated skin can tear, letting in unwanted bacteria and is more prone to oxidative stress, causing overall cell damage. If you have dry skin, it is more likely that you will experience stress marks due to a decrease in elasticity. And, if left untreated for too long, dry skin can become itchy, inflamed, and even lead to eczema. Skin is the largest organ in the body and its main function is to protect you by keeping harmful, foreign substances out and keeping moisture in. Dry skin compromises this function, making moisturizing and exfoliating skincare essentials.